Local Singer Abby Cates Scores Big On "The Voice"
One of TV's most popular contest shows, The Voice, is currently featuring a talented singer from Mason, Ohio. 17-year-old Abby Cates recently visited our studios for a conversation with Elaine Diehl about this experience and being chosen as a member of Kelly Clarkson's team on the show. Here's video of Abby's Battle Round. Abby Cates is a 17-year-old singer from Cincinnati Hills Christian Academy who has passed the blind auditions on the 15th season of The Voice on NBC. With a following of 180,000 on her Instagram account, The Voice staff invited her to a private audition in Indiana which was followed up with other interviews, ultimately leading to her appearance on The Voice's blind auditions. 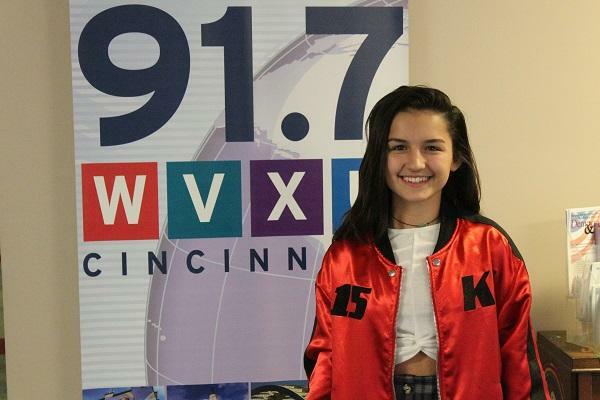 During Abby's conversation with Elaine Diehl in WVXU's studio on Tuesday, October 16th, she talked about her love of Kelly Clarkson's music and being thrilled to be on Team Kelly. She won a spot on Team Kelly with her performance of "Scars to Your Beautiful" by Alessia Cara. Abby also discussed taking voice lessons since the 2nd grade, the glam and music teams working with contestants on The Voice, and how wonderful the support of her family and school is. Abby Cates's next appearance on The Voice will be the battle rounds next week.